Black square caused by hydrocarbon contamination seen in SEM image. Carbon buildup leading to loss in reflectivity seen on an EUV mirror. The Evactron® Decontaminator, on the other hand, is a small device which is attached to any vacuum chamber allowing for direct in situ cleaning of the vacuum chamber. The Evactron® Decontaminator has a valve manifold which introduces a small stream of gas, such as room air, oxygen or hydrogen, into the vacuum chamber. An attached pressure sensor is used to control the amount of gas flow. The gas flows past an electrode energized by a low power (5-20 Watts) radio frequency (RF) generator. This will create RF plasma localized in the region around the electrode. The Evactron® RF plasma creates radicals that chemically etch and remove hydrocarbons, organics, and surface carbon from SEMs and other vacuum systems. Contaminants are ashed into volatile products which are removed through the roughing pump. As seen in the figure below (left), the radicals are carried out of the plasma into the main chamber by convection. In the chamber they react with all exposed surfaces, including the specimen if present. The plasma itself is confined to the Plasma Radical Source (PRS), which prevents ion bombardment damage to the instrument or specimen. Cross-section of SEM chamber illustrates how the Evactron® Decontaminator removes hydrocarbons from the system. The plasma is confined to a small chamber on the left of the larger SEM chamber. Radicals flow through the SEM chamber; these are shown as convective streamlines. 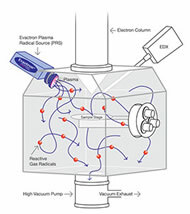 The radicals encounter and chemically etch contamination in the vacuum system. The products (CO2, CO and H2O) are removed through the Vacuum Exhaust. 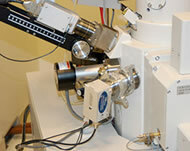 SEM chamber with Evactron® Decontaminator Plasma Radical Source (PRS) attached. An adaptor flange is used to mount the Evactron® Decontaminator to the SEM. In low-power room air plasma, a large amount of the electron energy is distributed to vibrational excitation of oxygen and nitrogen molecules. Oxygen has a lower dissociation energy (5.1 eV) than nitrogen (9.7 eV), so these vibrational excitations are more likely to lead to oxygen molecule dissociation than nitrogen molecule dissociation. A small fraction of oxygen molecules will be dissociated by electron bombardment to form oxygen radicals, and these radicals will leave the PRS and go into the main vacuum chamber. Greater RF power will lead to a greater number of nitrogen and oxygen ions, which in turn will lead to the formation of secondary products, such as NO. The decontamination process generally begins with hydride extraction (hydrogen atom removal) in the contamination which creates more reactive sites. These sites undergo additional reactions by radicals, which break down hydrocarbon contamination into volatiles. For fluorocarbons, the C-F bond oxidation reaction is very endothermic and these compounds are non-reactive. In silicon and on most metals a stable oxide layer has already formed on the metal and Evactron® oxidation will not penetrate this oxide layer. Removed contamination by Evactron® cleaning results in no black square. Carbon buildup removed from same EUV mirror shown above by the Evactron® Decontaminator. Yellow tape is covering right side of the mirror.